OUTAGE COSTS? - American Crane & Equipment can help reduce them! OUTAGE COSTS? – American Crane & Equipment can help reduce them! Our revolutionary Nuclear Rated Telescoping Jib Crane will enable you to perform additional outage tasks to save significant time and money. Advanced features such as four (4) ranges of motion allow for better perimeter hook coverage and more precise material placement. As a result, the Telescoping Jib Crane can outperform the polar crane; and it’s also an ideal choice for servicing it. 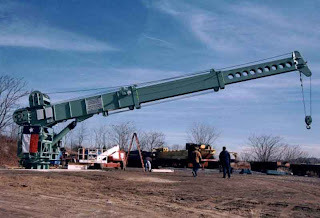 The Telescoping Jib Crane‘s capabilities include an 11,000 lb capacity, 360 degree rotation, and variable speed control. In addition, its modular design allows installation in existing facilities. Call us today and let American Crane’s experienced staff assist you with planning, installation, and start up. In most cases, the crane will pay for itself in just one outage!